Editor’s note: Alex Teu is the vice president of business development at Oxygen Cloud and odrive. 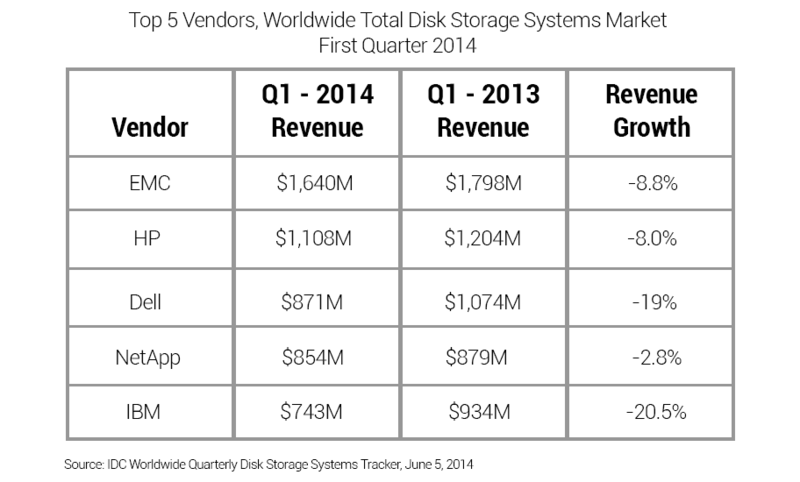 “Dead man walking.” That is what many in the storage industry are calling IBM’s storage hardware business. But its storage competitors, including EMC or HP, should not be so quick to wave that flag, as they may follow suit before too long. We are already seeing similar trending signs of their downfall. As you can see, the negative trend spans the industry and does not discriminate. The cloud storage war being waged by Amazon, Google and Microsoft has been well publicized, and is resulting in the cost of all cloud infrastructure including storage racing to zero. As you can see from the graph below, Amazon was the only real game in town for several years, and the price of cloud storage hardly moved the needle. It was only after Microsoft and Google got into the game in 2010 that we saw any real price movements. There were two distinct price battles waged in 2012, with moderate price drops. Earlier this year in March, the gloves came off and the cloud storage prices bottomed out to the current $.024/GB level. The price points plotted on this graph constitute the standard storage prices listed by the providers. The providers offer different price points for storage based on factors such as region, redundancy and volume tiers. Where do we go from here? Undoubtedly, to zero. When? Perhaps as soon as this summer or by year end. Will it literally go to zero? Maybe no, maybe yes. 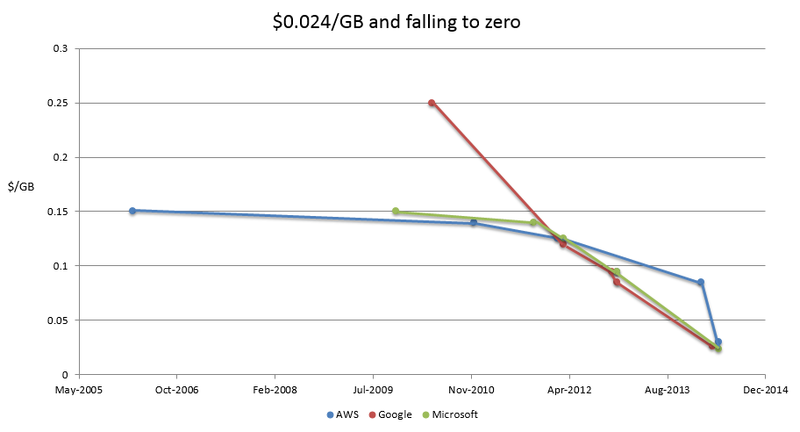 If you only had to pay $.001/GB, that works out to $1/TB. Oh yeah, that feels like zero! It’s well established that cloud storage is 10X better. It’s more accessible, more secure, elastic, pay-as-you-go. Today, we are all on mobile devices, work everywhere and generate ever increasing amount of data. Our work and personal lives are set up as the perfect playground for cloud storage. Now that the cost of cloud storage is near-zero, the business choice to abandon clunky, expensive traditional storage is a no brainer. For most small businesses and newer companies born in the cloud, the shift to cloud storage is already happening and will be at close to 100 percent in three years. For larger businesses with existing data centers and lots of existing data, the shift will be slower and take a different path. Most will start with less sensitive data sets. As reflexive concerns like data sovereignty and regulatory compliance give way to convenience and common sense, the transformation will be complete. Within five years, I believe that a majority of enterprises will have at least 50 percent of their data in the cloud. No doubt, the traditional storage players will attempt to slow the adoption with the same tired, overplayed FUD, but the train has already left the building. However, this will just be prolonging the inevitable. It will be like the un-dead walking among us. As we’ve seen in the movies, the zombies can now run fast and talk intelligibly. Perhaps the traditional storage players have a fighting chance after all. Author’s note: The data research for the top graph involved a mix of public announcements, a search of the Internet Archive and efforts from others who attempted to track the price changes such as David Rosenthal. This also involved some guesstimation on my part for some begin and end dates of a price change as I was able to ascertain a price on a given date but was not able to confirm with a public announcement.